Once in awhile, it’s good to take stock of what sells well at other museum shops. This can help you decide what might sell well at your store. 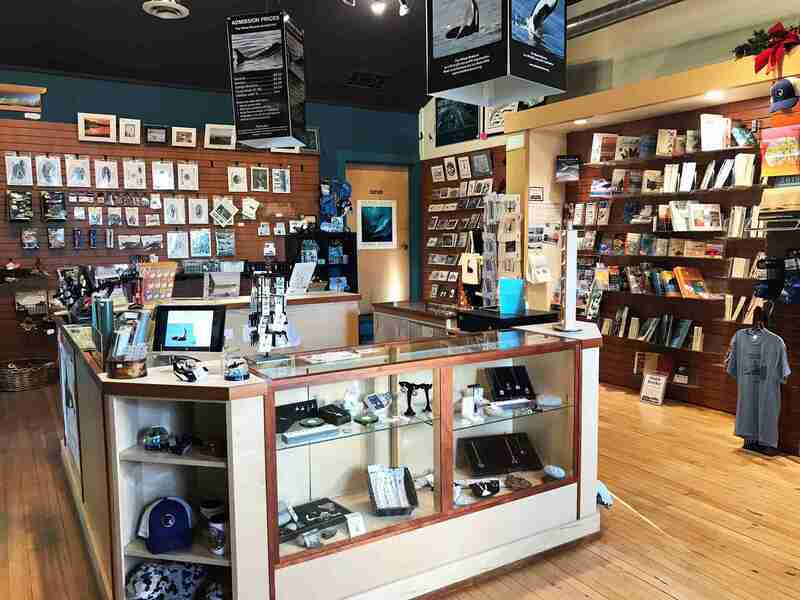 A view of the cash wrap and sales floor at The Whale Museum. Logo mugs and cups, both for travel and for home use, sell well at the 950-square-foot store. Anything portable that has a purpose does well as a gift item, such as ship’s bells, magnifying glasses, bottle openers, paperweights and compasses, said Marifrances Trivelli, director and store buyer, Los Angeles Maritime Museum, San Pedro, Calif. “We try to be aware of TSA restrictions, so purchases can usually be safely transported in a carry-on bag without any concerns,” she said. Assistant Manager Christopher A. Gonzalez of the Maritime Museum of San Diego in California. 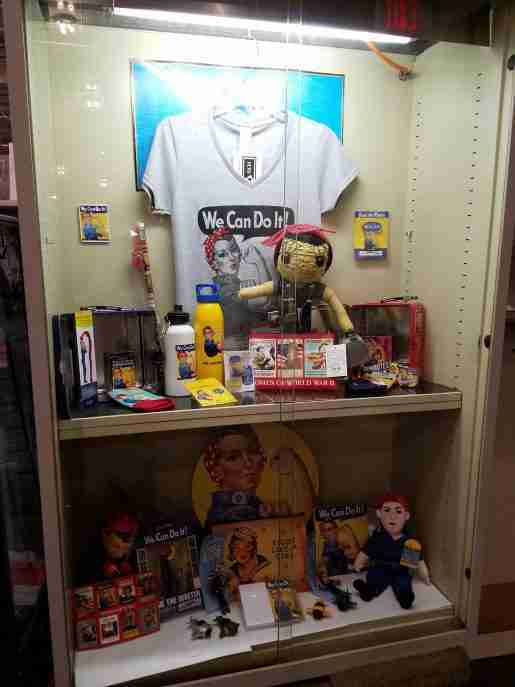 Children’s toys and plush with a nautical theme sell well for the store. Thousands of school children visit Los Angeles Maritime Museum each year. On average, they purchase an item around $5 at the 800-square-foot shop. 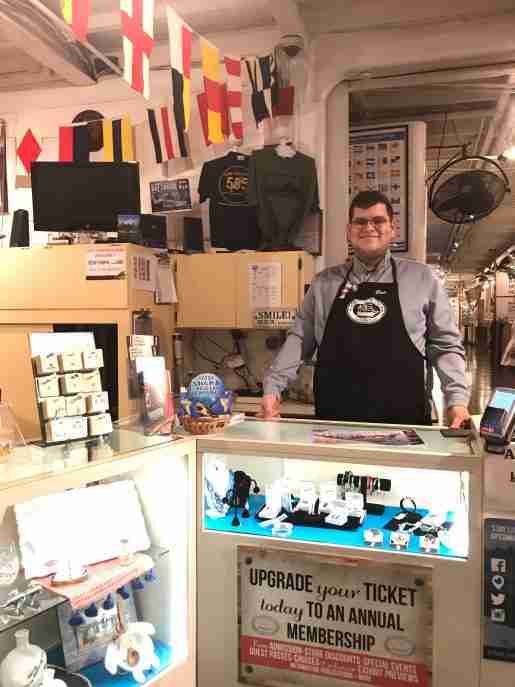 “They love liquid keychains containing small plastic fish or ships inside, as well as jewelry from vendors such as Cool Jewels,” Trivelli said. Plush items are always popular, particularly from the Fiesta line. For older visitors, books on local maritime history fly off the shelves. The shop garners less than $100,000 annually. For Gonzalez, branded T-shirts which feature different vessels are a hit. But location-branded items, such as ships that have “San Diego” printed on them or name-dropped shot glasses and magnets, also do well. “We try to name-drop every item that is available,” he said. Rachel Bendele, operations/gift shop manager, Sable Points Lighthouse Keepers Association, Ludington, Mich., said lighted lighthouse replicas and small lighthouse replica ornaments are tops in this category. “They replicate the actual lighthouse’s structure and serve as a reminder of their visit for years to come,” she said. 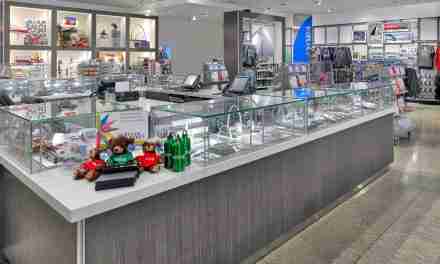 The four gift shops range from 200 to 1,000 square feet, and have combined sales of around $450,000. Branded T-shirts, magnets, ornaments and key chains are popular for Hurd, because they are exclusive designs for the museum. Coffey said Orca plush animals are top-selling souvenirs. “A lot of kids visit; this is an inexpensive way for them to remember their trip,” he said. Small, colorful, lightweight metal signs that say “beach” or other nautical slogans do well for Trivelli. “They are an easy way to brighten up a home or work space, and since we are in southern California the beach theme is always popular,” she said. Two signs that sell well for Gonzalez read, “The beatings will continue until morale improves” and “This room is a wreck.” “This is mainly because they are funny sayings and are pirate-themed, which continues to be a hot seller,” he said. 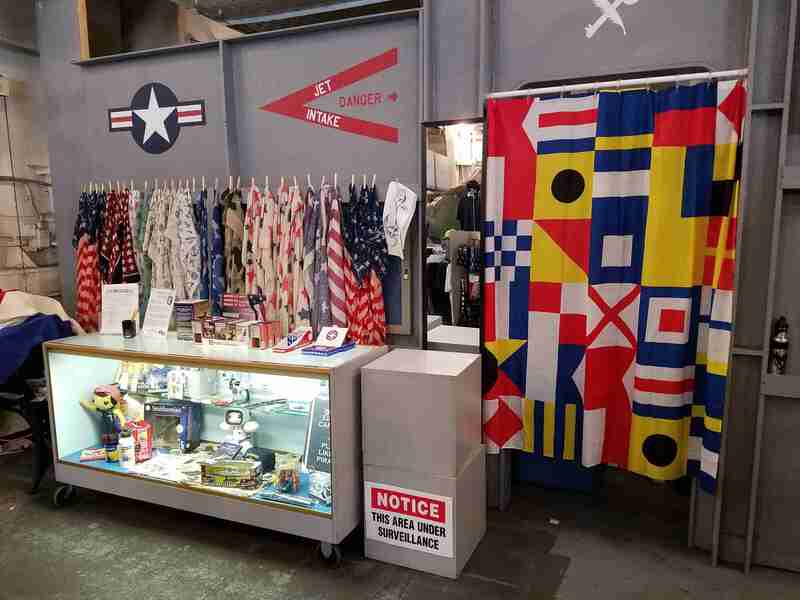 Small houseware items such as salt and pepper shakers and tea towels with nautical-themed artwork are tops in this category at the USS Hornet Museum, as well as coffee mugs, pint glasses, pilsner glasses and shot glasses. “Many guests visit from out of town and don’t want to carry large or heavy items,” Santell said. “I also stock afghan blankets seasonally for our July 4th celebration event. When visitors watch the San Francisco fireworks from our flight deck, it can get chilly.” The 800-square-foot shop makes between $250,000 and $300,000 annually. Hurd said exclusive custom made designs that are present on the museum tour are the top sellers in this category. They include Paul Revere statues, Robinson Tea Chest wooden chests and replicas of the Boston Tea Party ship. 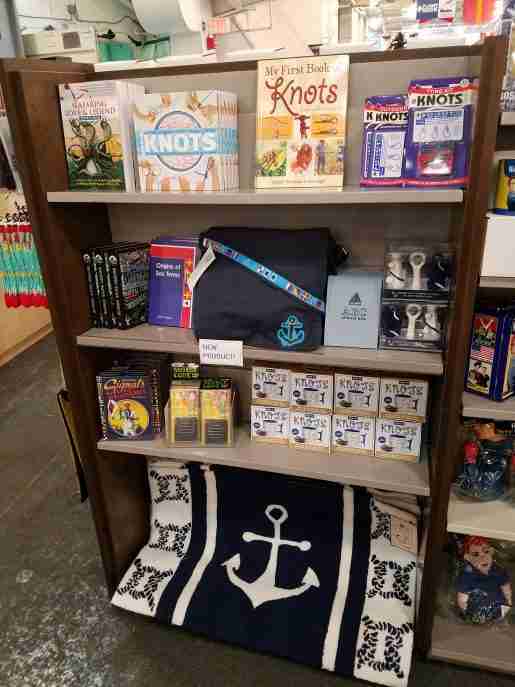 A merchandise display, including books about knots, at the USS Hornet Sea, Air & Space Museum in Alameda, Calif. Apparel and headgear sell well for the store. Trivelli sells a line of wind chimes from artists in Georgia who make glass chimes from wine bottles. “They are very attractive and not something you run across every day,” she said. Also, glass fishermen “floats” are a popular décor item, especially ones that contain a battery-operated light. Mudpie cheese boards and spreaders do well in Gonzalez’s 800-square-foot store as do handmade rolling pins and cutting boards made from leftover wood from the construction of the Spanish galleon San Salvador. 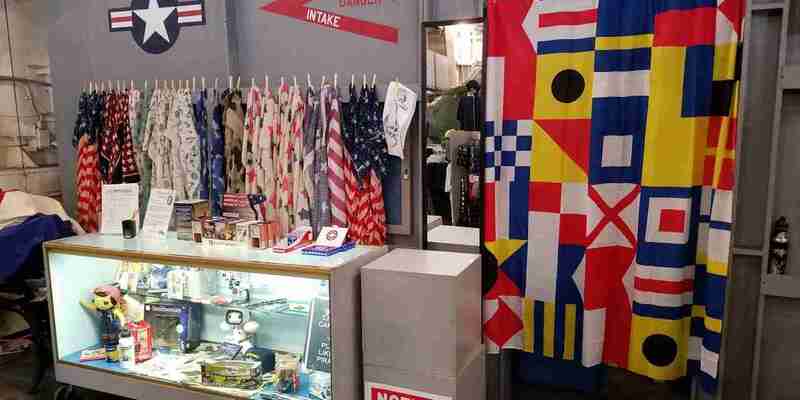 “They match the museum’s nautical theme,” he said, adding that staff try to select items that they think would look good in their own homes. Coffey said mugs and cups, for both travel and home use, sell well at his 950-square-foot store. They must show the museum’s logo. Likewise, Bendele said coffee mugs and glasses never seem to go out of style. Lighthouse pictures and prints also sell well. 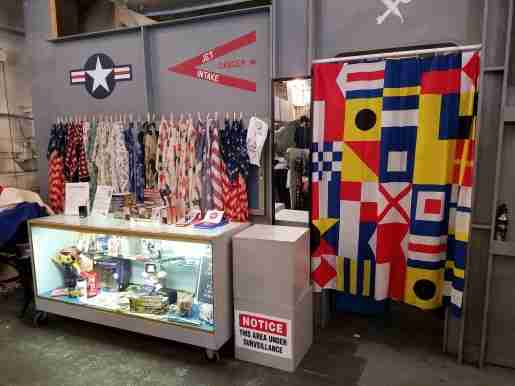 A colorful merchandise display at the USS Hornet Sea, Air & Space Museum. Good-selling in the home décor category at the shop are salt and pepper shakers, tea towels with nautical-themed artwork, coffee mugs, pint glasses, pilsner glasses and shot glasses.